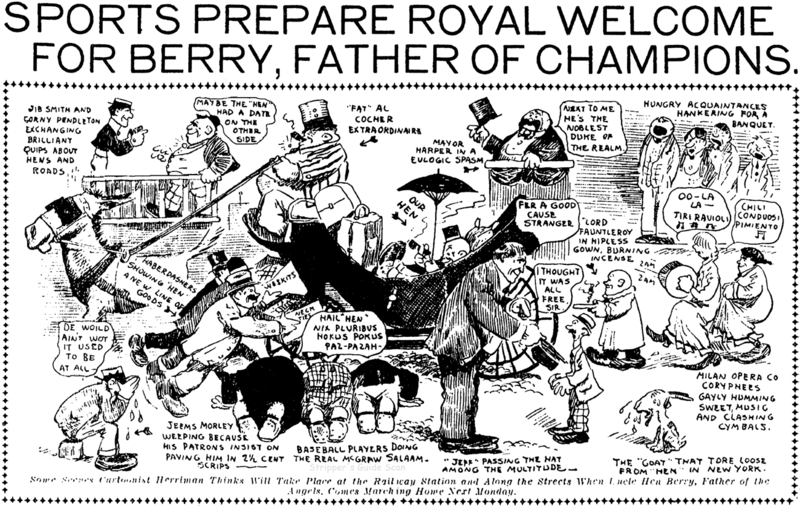 Saturday, November 9 1907 -- Hen Berry, manager of the Angels, returns from a trip to New York City to a hero's welcome. What was he doing in Gotham? I dunno, all I have of the article is one line of the story. Was he trolling for Major League offers? Could be. I have that story ... but it never says what he was doing in New York, just that he was "looking at the tall buildings and rubbing elbows with the truly great," and that he "purchased the entire stock of a famous Broadway haberdasher." It generally treats him with all the sarcasm that I wish my paper in New Orleans would visit upon our local sports team owners. Isn't it amazing how the sports page stories can go on and on and on in the LAX paper without imparting more than just a few tidbits of info? I know nothing about illustrator R.F. James except that the prolific penman (penwoman?) 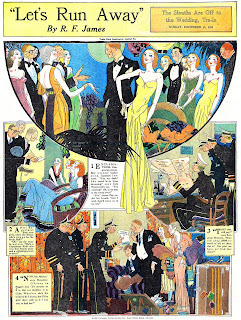 did at least three magazine cover series for Hearst in the early 1930s in addition to much other newspaper, magazine and book illustration work. Let's Run Away is the earliest of those series I've found, running from October 4 to December 20 1931. This one was done for the Newspaper Feature Service arm of the Hearst organization. Let's Run Away is the story of a lovestruck pair who run off to Cuba to get married, told in a nigh-impenetrable Jazz Age idiom. As with most of the magazine cover series, the story is just a minor distraction from the pretty pictures. James worked here in a style very similar to Russell Patterson, his most noticeable departure from that model being the white doll-like faces of the women.This odd approach makes them look like cadavers to me, not at all the china doll imagery I assume James was going for. In this particular example (the only one I have on hand) the effect is accentuated by the colors being a bit off-register. Possibly Lee Roy F. James. "Lee Roy F. James, magazine and motion picture artist, is dead at 80. James, who died Sunday at a rest home, was an illustrator for Colliers, Red Book, Ladies Home Journal and other magazines. He was a member of the Metro-Goldwyn-Mayer motion picture studio from 1935 until he retired in 1947." Your sample shows quite a stylized departure from the illustrations I find in a Google Books search for R. F. James. Stumbled across your blog and "Let's Run Away." R. F. James is my maternal grandfather. Full name is Lee Roy Fitzgibbon James. This piece is much more stylized, possibly to fit the newspaper cartoon context, than the bulk of his work. Do you have any other examples of his work? I have continued his legacy in the arts in another venue - in the field of architecture. Unfortunately this is the only example of R.F. James's newspaper magazine covers I have on hand. He is also my maternal grandfather. I have a strip similar to this one. Also my grandfather. I have half a dozen of his magazine illustrations, mostly done in charcoal, brush, and pen and ink. I also have about the same number of his strips, including Sylvia the Deb Detective and Don't Tell Auntie. It's the same thing: the jazz-age idiom and all. they are true period pieces. Lee Fitzgerrell Smith is my sister and James Bryant my cousin. My sis's mom and mine was a well regarded plein air oil painter in Laguna Beach. She was Roy's daughter: Marcia James Fitzgerrell. I have Gus Mager down for no less than 34 different newspaper comics features, which if not a record comes pretty darn close. While Mager is best known for his 'monk' strips, including Sherlocko the Monk who eventually morphed into the long-running Hawkshaw the Detective, Mager crossed genre boundaries with ease. 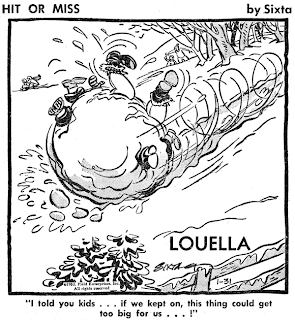 In 1926, after a string of disappointingly short-lived features, Mager came up with Oliver's Adventures. While it is undeniably an obscurity, it actually ended up being one of Mager's longer-lived series. Mager probably saw the popularity of Little Orphan Annie, which was quickly gaining national prominence, and had the rather obvious idea of swapping her out for a boy. It was, at least as legend has it, coming full circle since Harold Gray supposedly first proposed his classic strip as Little Orphan Otto. Ron Goulart also notes the similarity, both in art and story, between this strip and another early adventure entry, Phil Hardy. Plucky little Oliver roamed all over, finding friends, enemies, thrills and spills everywhere he went. Being a boy, he avoided some of the over-the-top saccharine sweetness of Annie, and generally played down the "li'l philosopher" angle of Gray's creation. For cartoonist Mager, who generally gravitated toward humor material, it was an impressive turnabout. Although he couldn't really compete with other adventure strips in the art department (he brought a bigfoot sensibility to the production), the adventure material is exciting, well-researched and deftly plotted. Although reported start dates for Oliver's Adventures are all over the map, many claiming as late as 1928, the strip began in May 1926 as evidenced by an announcement in Editor & Publisher (anyone know the exact date?). 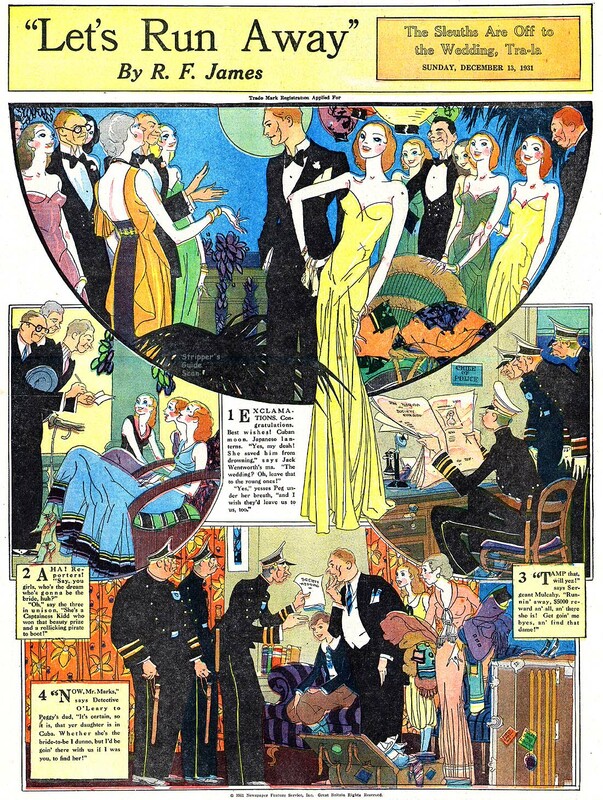 The McNaught Syndicate distributed the daily strip throughout its life to a relatively small but loyal list of papers. Mager found a more comfortable (and probably more profitable) berth in 1931 when Rudolph Dirks offered to have him revive Hawkshaw the Detective as the topper to The Captain and the Kids. 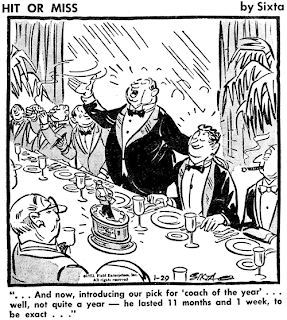 Mager took the job but wisely kept on with Oliver as a fallback position, a choice that worked out well for him when in 1932 Dirks had a contract dispute with United Feature Syndicate. For the better part of a year both Dirks and Mager were off the Sunday strip, with Bernard Dibble subbing, while they negotiated with United. In 1933 the dispute was settled and Mager returned to Hawkshaw. Mager kept up appearances with Oliver's Adventures for well over a year more, still hedging his bet on Hawkshaw. On May 21 1934 he changed the name of the strip to Oliver and his Dog for no obvious reason (the direction of the strip didn't change) and then, apparently satisfied that Hawkshaw was going to survive, Oliver's Adventures was discontinued on October 22 1934. Do you have a list of the top cartoonists with the most different comic features? 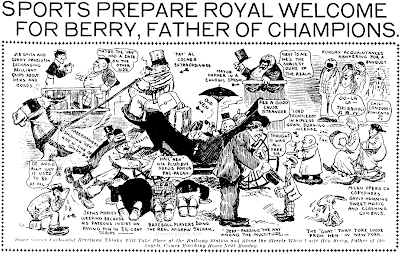 My first thoughts were Herriman, Goldberg, and (probably foolishly) McCay. Would I have come close with any of those guesses? I did a creator cross-index for the book which includes both credited and uncredited appearances. I was so focused on just getting it ready for deadline I never did go back over it to look for the cartoonist with the most credits. I'll check into it and get back to you. OK, went through the cross-index. Goldberg isn't even in the running, neither is McCay. Herriman has a very respectable 38 features to his name. But the winner, with a whopping 55 features is .... going to be anonymous 'til the book comes out! Only two creators top the 50 mark, another 4 are at 40 or above. When did the practice of putting a typeset episode title above a strip end? That's a question Jeffrey Lindenblatt researched awhile back. I THINK he told me that a few strips continued to supply them right up into the 60s and 70s. And if you count Zippy the Pinhead, they are still done for at least one strip! Today we have a real moldy oldie for you, Gay Gazoozaland by J.B. Lowitz. 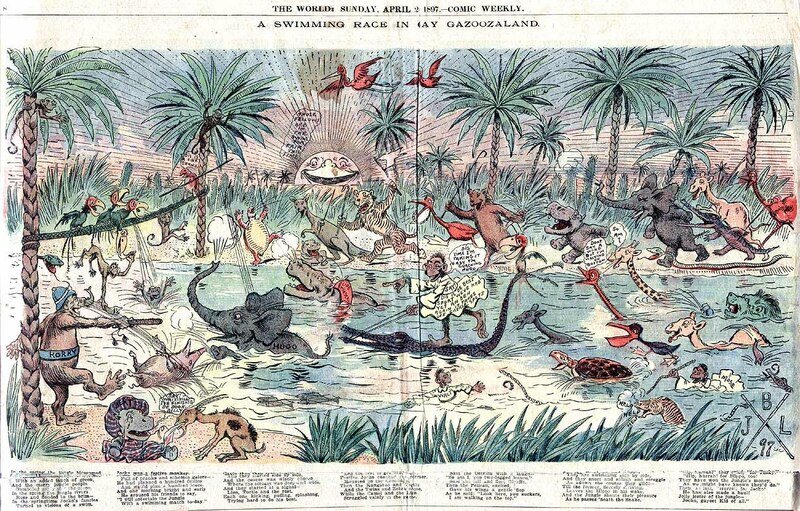 It's a fairly standard jungle animal comic of the type that was very popular in the first decades of newspaper funnies, but with the added bonus of monkeys dressed up as the Yellow Kid! Is the one tagged Walt named after Walt McDougall I wonder? Dating is a problem on this series. Ken Barker's New York World index wrestled with it no less than three times. In StripScene #12 Barker has it as running from February 28 to November 7 1897. Then in StripScene #18, saying that the Johnson brothers inspired him to dig deeper into the early years of the World, the dates on the series were amended to June 21 1896 to May 16 1897. Then in the last published version of the index, in Inks Vol. 2 #1, the dates revert to those published in StripScene #12. That's confusing enough, but in my Stripper's Guide entry on the series there is an unsourced credit as well -- I have Daniel McCarthy supplying the art on the final installment of the series on 11/7/1897. Someone must have given me this piece of information because I haven't indexed the early World, but I failed to note my informant in the source notes. Unless someone can confirm this credit it's going to have to come back off the listing. Thanks to Cole Johnson who supplied the sample! Even though old age has curtailed my work in the field of the old time newspaper comics, I read your well appreciated blog on a regular basis. The confusion with regard to the New York World postings is due in part to two factors. In the first place not all the issues of the World were preserved on microfilm. Hence there is some uncertainty with regard to whether or not they appeared in earlier issues. In the second place some Pulitzer material appeared in the St. Louis Post-Dispatch even when it did not appear in the parent New York World. That is what the Cole brothers brought to my attention. I was hung on a dilemma when it came to posting New York World dates. Should I rely only on what could be verified as having appeared in the World? Or should I give Pulitzer dates and include material which appeared in the St. Louis paper and possibly elsewhere even if not in the parent New York paper? I noted these problems in the foot notes to my third version in INKS. Thanks very much for the explanation. I know trying to pin down this early material is devilishly hard and I didn't mean for one second to be bellyaching about your indexing. I was trying to illustrate that even we so-called experts have no end of trouble with this stuff. I, too, have those Johnson brothers constantly pointing out my mistakes! There was a Corey in the early comics. Could the police monkey labeled Korrey be for him? Great catch Grizedo! J. Campbell Cory was at the World then. 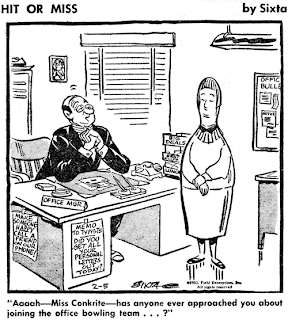 I think that leaves only "Mose", which just might be George Luks -- he did a strip called "Trained Chicken Mose" around this time. Oops. Forgot about Hugo the elephant. Haven't a clue if he's also someone in the bullpen. Hello, Allan, and Hello, my old friend Ken Barker!-----Which series had different dates in the St.Louis Post-Dispatch from the N.Y.World? I can think of a March 1902 section that ran in the P-D that was totally different, but it's an oddity. Apparently a back-up section (all one-shots) because they didn't have the real section available. -----Cole Johnson. Well, you go away for awhile and Blogger goes and changes everything on you. Hopefully this post will look 'normal', but the interface for creating it has changed quite a bit, so I'm a little disoriented here. Anyway, here we have Hit or Miss by George Sixta. It was a sports humor panel done for Field Enterprises. Field, as I almost certainly have said before, was a syndicate initially created by Marshall Field to sell features from his Chicago Sun newspaper. When Field started the Sun he found that Chicago was pretty much all sewed up with exclusive contracts on the better features. He resolved to purchase his own features and market them. Ironically, the Field Enterprises syndicate ended up being a better moneymaker than the Sun itself. It has been said that the flagship feature, Steve Canyon, was responsible for keeping the Sun afloat for many years. Sixta's Hit or Miss was the sort of feature that just sort of makes you shrug. It was workmanlike but never memorable. 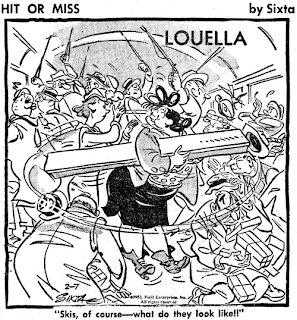 Sixta tried to inject a little more personality into the feature by adding the recurring character Louella, a big-boned, rather dim sports enthusiast. Presumably a Rubenesque gal who liked sports was supposed to be ludicrous ... guess George never saw any roller derby. 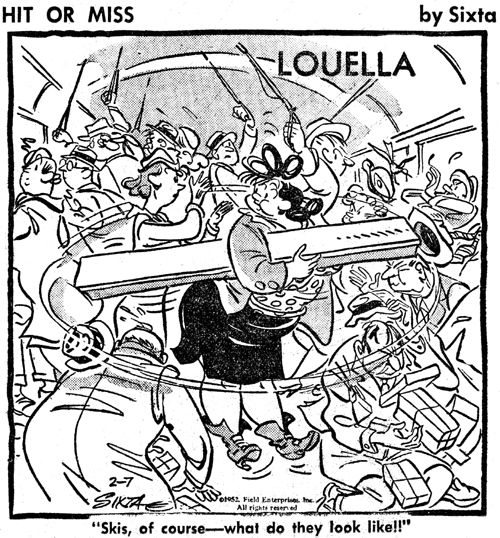 Louella appeared twice a week, with special billing in the panel, through much of the run. Hit or Miss was Sixta's second Field Enterprises effort, starting on November 1 1948. In 1953 he sold a third feature to Field, Rivets, and handed off the baton on this one to someone who signed himself Ryan. Since the feature wasn't exactly doing major league business anyway, it faded pretty quickly and hit the syndication showers on January 9 1954. PS -- can a football fan explain the final example above for me? I assume there's some significance to the 11 months and a week, but I'm missing it. Hello Allan----Was his name pronounced "SiCKS-TA" or "SEES-TA" ? I remember RIVETS running in the PHILLADELPHIA INQUIRER for about thirty years.-----Cole Johnson. I think joecab is right. Though named Coach of the Year he didn't even serve a full year. A laugh riot, that; I'm snapping my galluses already. I just assumed SICKS-TA for no good reason at all. Could have asked a relative of his who contacted me many moons ago, but it never even occurred to me. ... and if you guys are right about that last panel, well, geez, that's a pretty sad excuse for a gag. In 1983 the NCS held their Rueben Awards Banquet outside of New York City for the first time. It was at the Beverly Hills Hotel in Los Angeles, CA, and I attended. With everyone wearing tuxedos who I'd never even seen in a suit and tie of any sort, the bar looked like it had been invaded by penguins. Milling around the banquet room meeting so many great names in the cartooning world whose work I'd admired all my life, I was shocked to find myself chatting with an extremely gentlemanly old man who introduced himself as George Sixta, and he pronounced it Sick-sta. I'd always wondered if it should have been pronounced Sees-ta and that maybe he had just given up and pronounced it the way everyone said it. I'm thinking the joke, based on the use of the word "lasted," is that the coach of the year was fired before he even served a full year term. My apologies for not updating the blog for a few weeks. There was a very sad event in my personal life that I am working through, something that will be painful for a very long time to come. Respite, though, comes from keeping busy so that I don't dwell on it. Therefore beginning tomorrow I plan to return to making daily posts, which will keep me occupied for awhile each day. I have no idea if I'll be able to keep it up but I'm going to try. 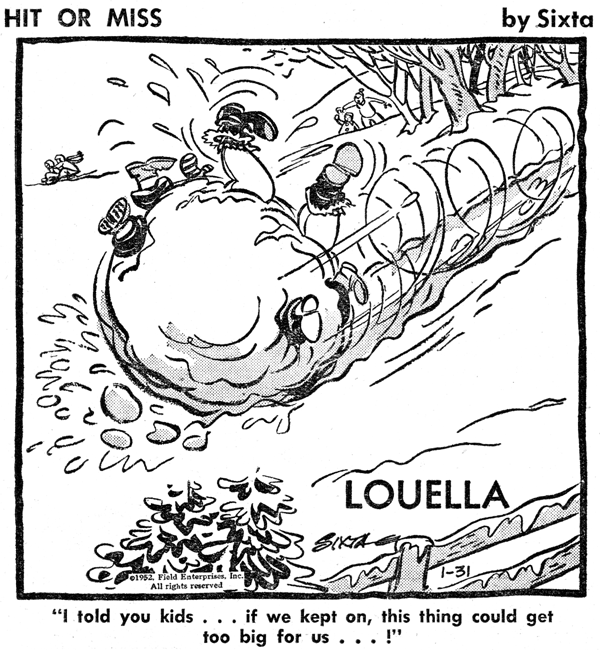 As you can imagine, comic strip history loses some of its capability to fascinate in the face of adversity. Welcome back; I'm sure we all want to express to you our heartfelt best wishes. Even the worst of times and feelings don't last forever. Be brave, be strong. WELCOME BACK ALLAN! We miss you a lot and look forward to more stripping! Sorry to hear about the "sad event". Glad that you're back and hope you're doing better. My condolences for your sad event, I hope you're coping well. You're correct that it is good to keep busy, though your "me time" is important to the healing process as well. Hello, Allan----My deepest and heartfelt condolences. I'm happy to see you come back, as your blog is a constant source of info and fun for me.God bless you, and I know things will get better.----Cole Johnson. Thank you for all your kind thoughts. It means a lot to me. Sorry to hear about the hard times, Allan. Hope you are feeling better soon.